Basilar Impression (BI) with Atlantoaxial Subluxation (AAS). An associated congenital C5-6 fusion, exaggerated cervical lordosis, upwards and posterioly pointed Odontoid tip contributing to marked foramen magnum stenosis. Significant compression over Medulla and CV junction cord. Terms Basilar invagination and Basilar impression are often used interchangingly for BI, because in both cases there is abnormal upward migration of the upper cervical spine, the tip of the odontoid process projects above the foramen magnum. But precisely, basilar impression is defined as upward displacement of C2 into the normal foramen magnum with normal bone, while basilar invagination is a similar displacement due to softening of bones at the base of the skull. Thus different terms are used according to whether bone is normal or not. Ultimately there is stenosis of the foramen magnum and compression of the medulla / cord resulting in neurological symptoms, obstructive hydrocephalus, syringomyelia or even death. 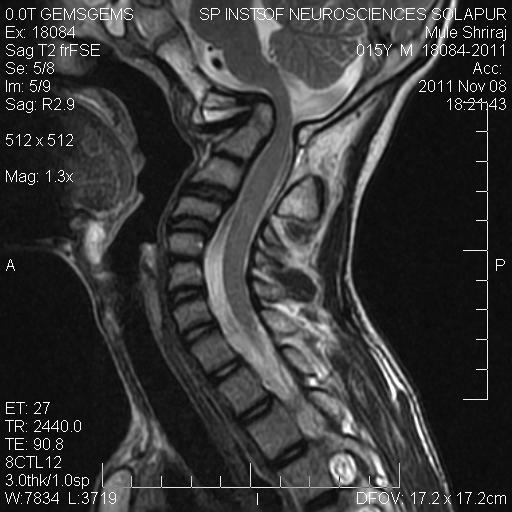 Neurological symptoms vary depending upon level of compression, degree of compression and structures compressed whether the spinal cord, brain stem, nerves or blood vessels. Symptoms become more apparent when the neck is bent. They include Posterior head pain, Neck weakness, Episodes of confusion, Difficulty swallowing or talking due to loss of muscle control, Dizziness, Cranial nerve disturbance, Loss of sensation of joint positioning, Lhermitte's sign (tingling when the neck bends backward), Weakness of the arms and legs, Orthostatic hypotension. BI may be present at birth. If develops after birth, is usually the result of injury or bone diseases like osteomalacia, rheumatoid arthritis, Paget's disease, Ehlers-Danlos syndrome, Marfan syndrome, and Osteogenesis imperfecta. Platybasia, is a related term and may be an associated finding. Basically is a flattening of the base of the skull due to increase in the basal angle of the skull. Depicted on a lateral skull film or saggital reformatted CT sections. Atlantoaxial Subluxation (AAS) may be an associated finding. Abnormal increased distance between C1 anterior arch and anterior surface of Odontoid. Distance greater than 3mm in adult and 5mm in children is abnormal. Results from an associated transverse ligament laxity or destruction. Depicted on lateral x-rays taken in extension and flexion.